The Department of Paranormal Affairs warned that Weredeer and wondering Minnesota Talking Land Squids are currently fighting over yard signs for the Bolingbrook United party. 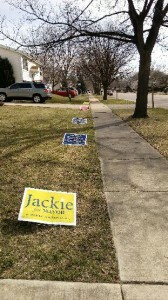 “All residents should use caution before putting up any political yard signs, especially signs from the Bolingbrook United party,” read the department’s press release. According to eyewitnesses, feral weredeer are venturing into Bolingbrook and are tearing down yard signs or removing them completely. Some folks have witnessed Minnesota Talking Land Squids defending the signs. Bolingbrook United and Bolingbrook First could not be reached for comment. A receptionist for Claar said he was busy and could not be disturbed. I believe I have found the optimum balance of rum and fatigue necessary to reading this blog.